The Homepage is entirely made of shortcodes. If you will import the dummy data, you`ll get all the homepage templates allready formed. All you have to do is to put your own conent instead of the demo one. All the shortcodes are explained in the Elements/Shortcodes section of the theme`s documentation. The silder dummy data is also available in the theme package. After you will import it, just replace the demo images with your own images and you are ready to go. After the homepage setup is done just set the Homepage you`ve created/modified to be the front page of your website. 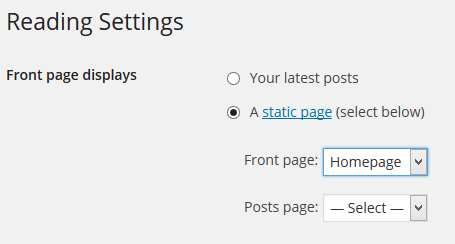 To do that go to Settings->Reading and set the Front page displays option to A static page and then choose your page from the dropdown list.